This salad made its debut at one of my private cooking workshops. It's about time to share it with you! I had to experiment with the dressing for quite a few times, until I got it just right. Now I'm really happy with the taste and texture. It's super creamy, tangy and rich. 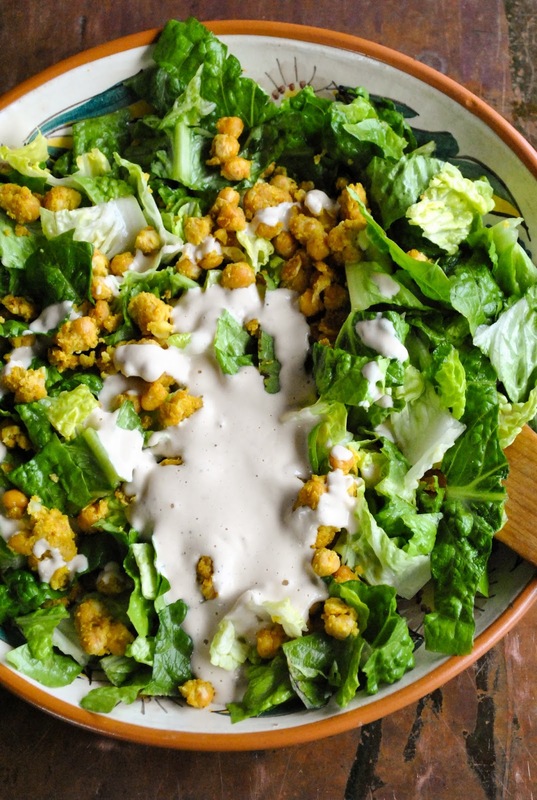 The dressing is just perfect poured on a juicy romaine lettuce and breaded chickpeas. These wonderful filling chickpeas are a great gluten free substitute for regular bread croutons. 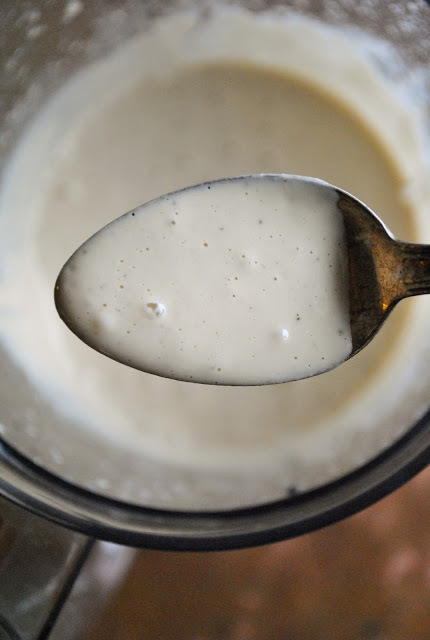 Caesar salad dressing is usually made with anchovy, but I used flax oil instead. For me, this oil tastes pretty much like some sea creature. And since I pour it on my morning porridge (omega-3! ), then I always have it at home. 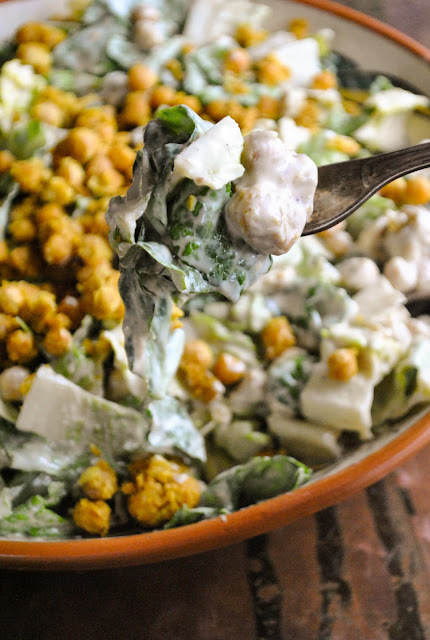 The base for the dressing is made out of cashews, which are just perfect for the creamiest texture. 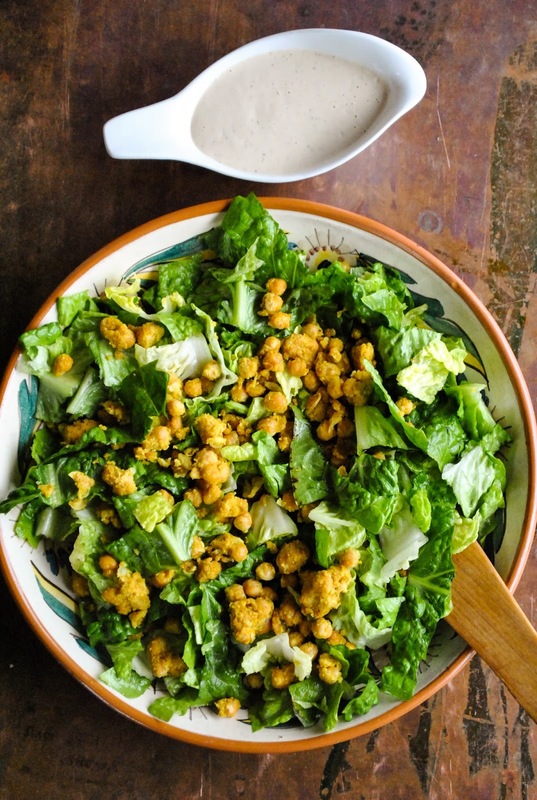 Add a few more ingredients and you have a fabulous salad dressing that really makes this recipe! 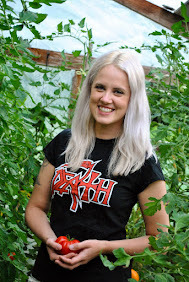 Romaine lettuce isn't that cheap at this time of the year, especially in Estonia. But you only need on head. And you always have a chance to replace it with iceberg lettuce. 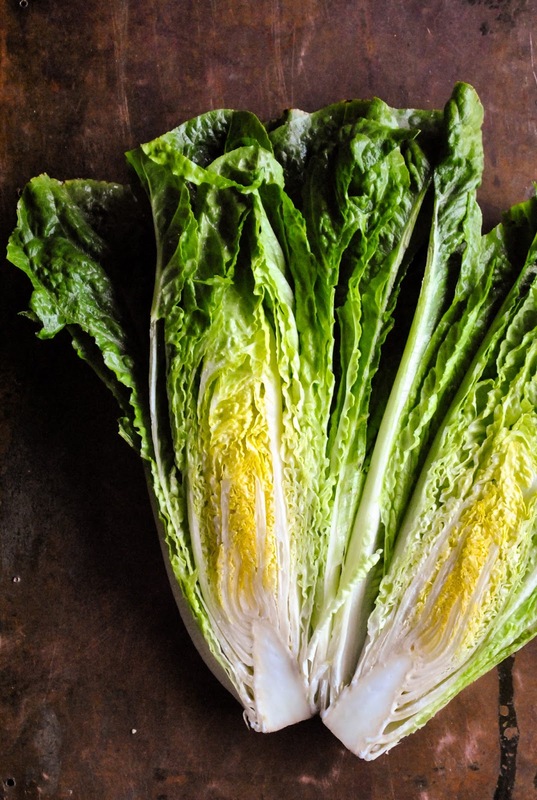 Caesar salad police will cringe at it, but let it! My love ate this salad so much, that I made a joke about changing the serving of this recipe to one person. I really hope you will love this recipe and it will be a great addition to your family dinners and dinner parties! Soak the cashews for a couple of hours or over night or boil them for 15 minutes. Drain and rinse carefully. Add the cashews into a blender along with garlic, flax oil, mustard, pepper, salt, soy sauce and water. Blend for a minute or two, until completely smooth and thickened. 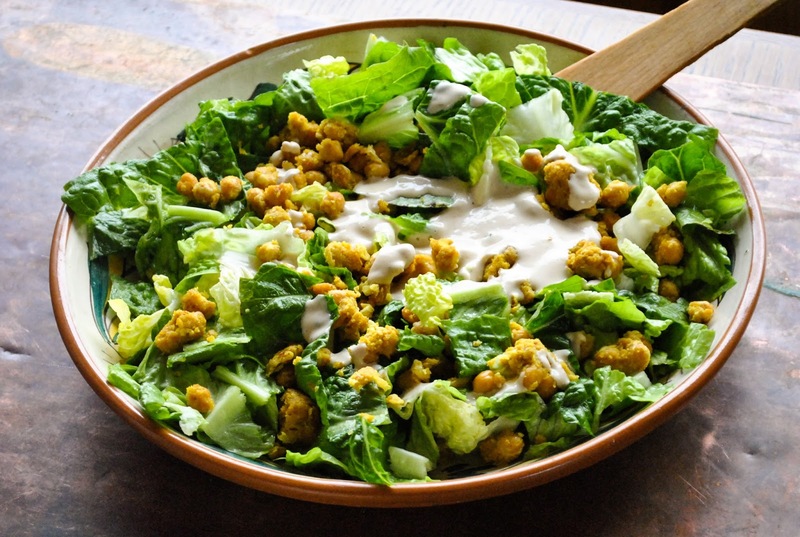 Prepare the breaded chickpeas and let them cool for a little bit. Wash the lettuce leaves and tear or chop them into pieces. Add a pinch of salt and mix it in (I used my hands for this). 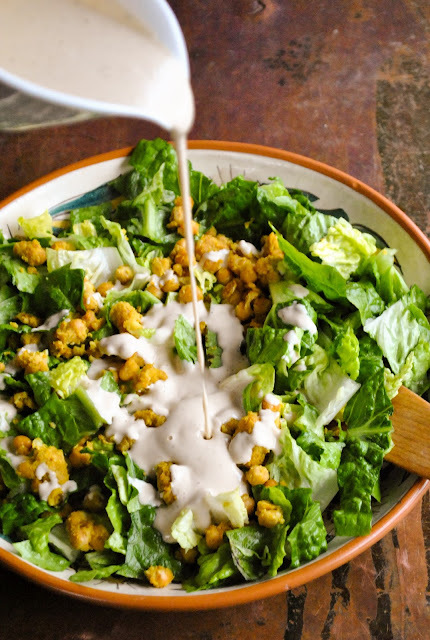 Mix the leaves with the dressing or put the leaves onto a bigger serving platter, drizzle on the dressing and top with breaded chickpeas. Enjoy!